The Natura Vive Skylodge, Cusco, Peru. 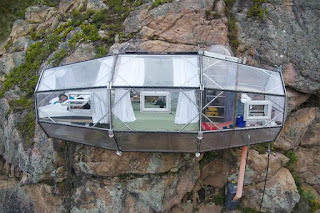 The hotel comprise a trio of 3 see-through suite capsules hanging 400 feet off the side of a cliff above Peru’s Sacred Valley in the Andes. Constructed from polycarbonate and aluminium, the hotel is run by Natura Viva, a Peruvian tour company. The region is appreciated for its natural scenery. Vacationers have to climb a 400-foot ladder to reach the suites.